Margot Robbie is used to playing rather frightening characters, such as the maniacal Harley Quinn from Suicide Squad. It’s fair to say the 28-year-old actor would never be content to play ordinary women, and we wouldn’t have it any other way. It now looks like Margot may have landed her most terrifying role yet in Mary Queen of Scots, where she plays the ruthless Virgin Queen herself, Queen Elizabeth I. With her powdered white face glaring over a Tudor ruff, it’s almost impossible to believe this is same beautiful, fair-haired star of I, Tonya. This is a truly unforgiving physical portrayal of the daughter of Henry VIII; hair balding beneath a lurid wig, gruesomely thick make-up smeared over a sickly, smallpox-ravaged pallor. Known for inheriting her father’s vanity, it is said the real Elizabeth I destroyed any paintings which dared show the decay of her health and beauty. And yet she gorged herself on so many sugary treats her teeth turned black and in her later years would greet courtiers with her breasts fully exposed. Kate Middleton she was not. Margot will star opposite Golden Globe winner Saoirse Ronan, who will play the title role of Mary Stuart, the Scottish queen raised in a French court who would become an eventual contender for the English throne. The film will follow the 16th-century rival monarchs as they assert their claims to the crown. Strong personalities and politics collide in a blood soaked showdown of power. 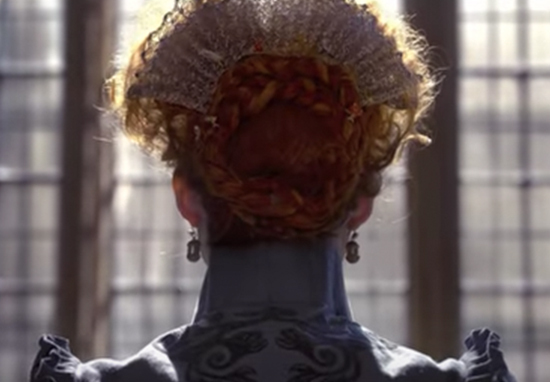 I am LIVING for this MARY, QUEEN OF SCOTS trailer. But also can't wait for Cate Blanchett to appear halfway through and play Elizabeth and Mary at the same time. Speaking about her dramatic transformation with Entertainment Weekly, Margot admitted she felt ‘inhuman’, leading to those on set avoiding catching her eye. It was nothing intentional, but I could see that it was uncomfortable for them, and the less they looked at me, the more isolated I felt. It’s not one against the other. It’s both of them against a particular environment that pitted them against each other. 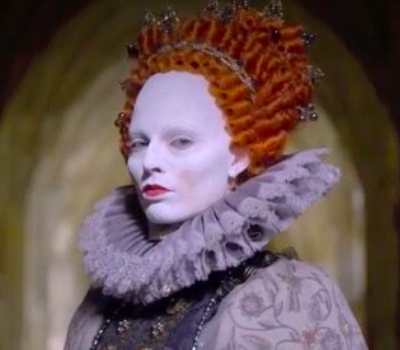 I love how at the end of the Mary, Queen Of Scots trailer, Margot Robbie literally surrenders her wig because when you're acting opposite the greatness of Saoirse Ronan, I mean…..
Elizabeth Tudor…born to power. Okay. Sure. It’s fair to say people are excited to Margot and Saoirse acting alongside each other, playing equally strong and intriguing historical figures. I cannot wait to see this movie!! The trailer looks brilliant!!! 2 strong leading women in history, portrayed by 2 strong leading women today!! Is it too soon to throw out the words Oscar buzz worthy? I’ve waited years for this moment. I just love Saoirse and Margot ?? Of course, in reality, the turbulent cousins never actually met face to face. However, they still endured a complicated, emotional relationship which lurched between respect and envy, affection and fear. And this uncomfortable bond is well communicated in the trailer, which shows the kinship fracturing alongside Margot’s crumbling appearance. Could this be a cinematic portrayal to match Cate Blanchett’s iconic performance? Mary Queen of Scots will hit hit UK cinemas January 18, 2019.